Dear sweet creatures, while Hero for WondLa is off to the printer and binder, I have turned my attention to preparations for a very special birthday to be held later this year. 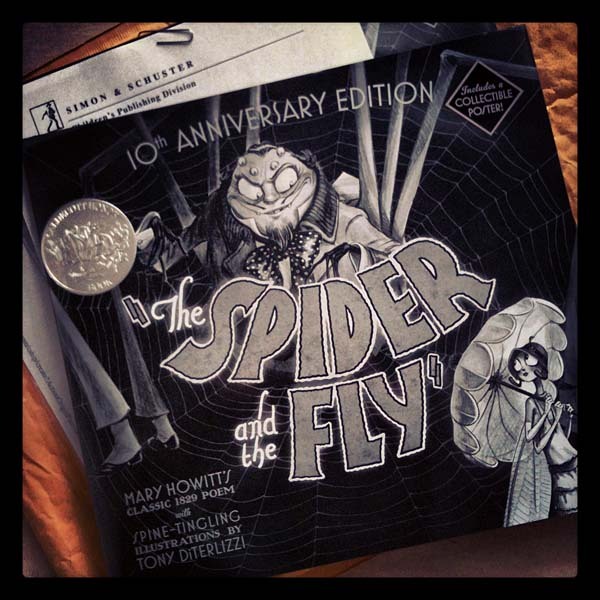 2012 marks the 10-year anniversary of my debut as a New York Times best seller, as well as receiving a Caldecott honor, for my adaptation of Mary Howitt’s 1829 poem, The Spider & The Fly. I have pulled the original artwork from my files and begun a special dust jacket (featuring new art), and which will also have a vintage 1930’s movie poster-inspired image on the flip side. After the 50+ digitally colored images for Hero, I am thoroughly enjoying the use of Holbein’s “Jet Black” and “Titanium White” acryla gouache – the same two colors I used to paint the original book. 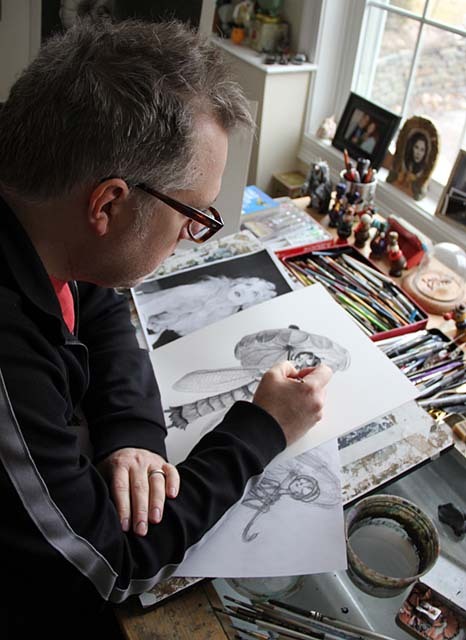 Above, from left to right: the original image of Ms. 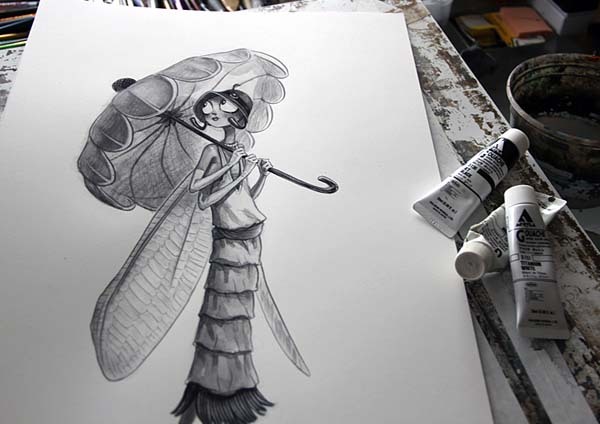 Fly from the finished book, the first character study I did for her (back in August of 2001), photos of 1920’s silent-film star Clara Bow, and the new image for the jacket and poster. All eight legs are crossed for more exciting news about Spider & Fly which I will reveal as the fall approaches. 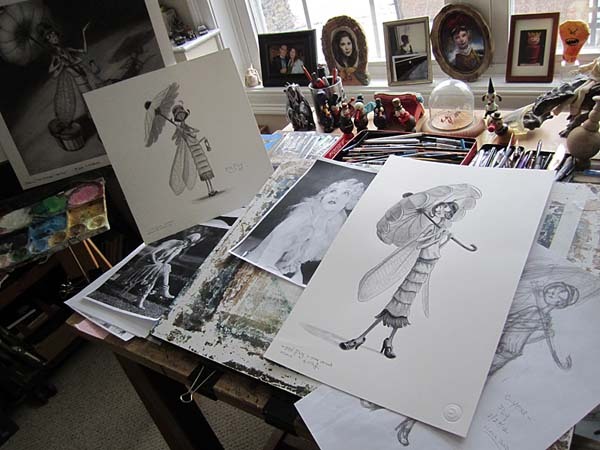 In the meantime, I’ll keep sharing images from the studio as well as old sketches and memories of the book’s creation. 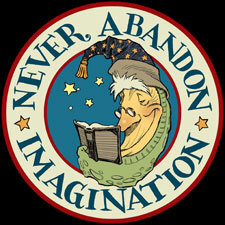 If you’ve any questions or requests, leave a comment. As I mentioned back in February, This fall marks the 10-year anniversary of my picture book adaptation of Mary Howitt’s classic poem, The Spider & The Fly. To celebrate, I’ve created a new (perhaps creepier) dust-jacket with a vintage 1930’s-styled film poster on the reverse side. 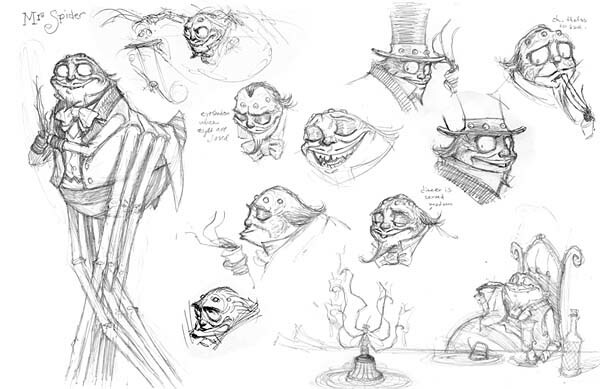 Unlike other stories where I’ve had to visually explore to find just the right shapes and forms for a character’s design, I had an instant vision of both Ms. 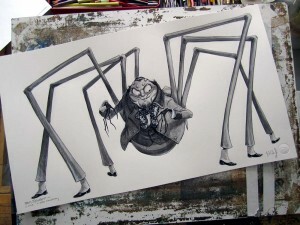 Fly and Mr. Spider when I was asked to illustrate the poem back in 2002. Of course I was conjuring the dark comedic visions of Charles Addams and Edward Gorey, but also I thought of the Spider as Lon Chaney in an old Dracula movie. I continued down the path of great actors to draw from, using a hint of Marlon Brando’s charisma and Raúl Juliá’s devilish grin. I completed the new art for the jacket in the same technique I had used back then: a detailed Berol Prismamcolor pencil drawing with washes of Holbein’s acryla gouache. However, what has changed since 2002 is my use of Photoshop. 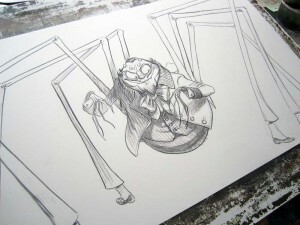 In fact, The Spider & The Fly marks the first time I had used Photoshop as a tool for creating final illustrations for a book. 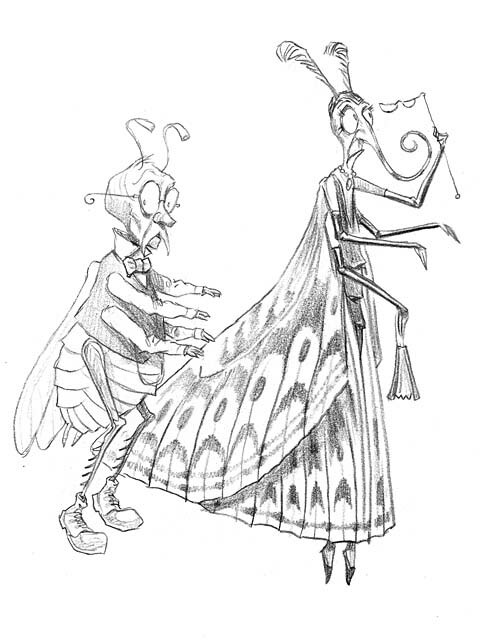 The ghost bugs were drawn separately and then digitally dropped into the final paintings, complete with an eerie glow. Since the new images for the 10-year needed to work both in the horizontal layout of the dust-jacket and the vertical format of the poster, I created them in the same fashion so as to have the freedom to move and size them. …looks like its time to get back to the drawing board. 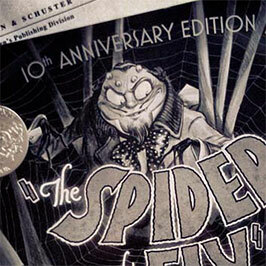 PS – Look for the 10-year anniversary of The Spider & The Fly later this month in a bookstore near you.